Construction of the building began in the autumn of 1907 and was completed on September 16, 1908. Fifty students were hired to move furniture, etc. into the new building over Christmas break. The building was dedicated on February 6, 1909. 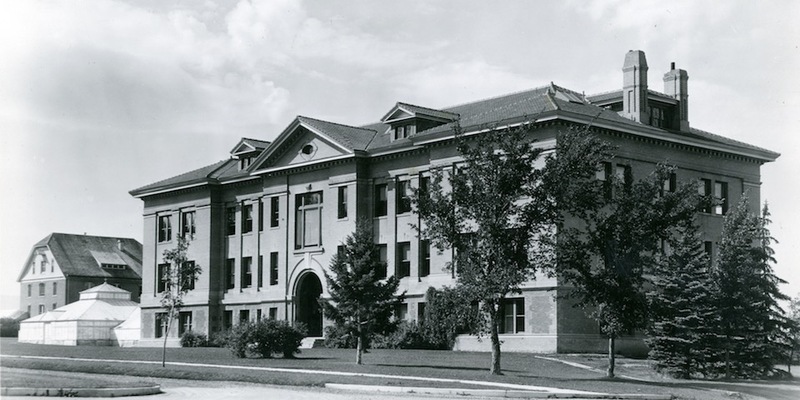 Originally known as the Agriculture Building or Agricultural Hall and later, from about 1930 to the late 1960s, as Morrill Hall, this structure was built for $80,000 with concrete footings, something new at the turn of the 20th century. The 17-inch thick exterior walls supported a red tile roof, reportedly only the second building in the state to have such a roof. The 13-inch thick interior walls were trimmed in red and white oak and Carolina pine and all floors were made of maple with the exception of the ground floor, which was poured terrazzo. Most of the original woodwork and all of the original floors remain to this day. The south wing of Linfield Hall was constructed between 1952 and 1954 on the site of the 1909 galvanized steel, cypress and glass greenhouses. Once completed, the Animal and Dairy Industry Department and the Range Management Department moved into the new space. The Department of Animal and Range Sciences still occupies this wing of the building. Morrill Hall was renamed Linfield Hall in 1968 after F.B. Linfield, professor of agriculture, Director of the Montana Agricultural Experiment Station from 1903 to 1937, and Dean of the College of Agriculture from 1913 to 1937. Professor Frederic Bloomfield Linfield (July 17,1866–September 24,1948) came to Montana as a Professor of Agriculture for the Montana Agricultural Experiment Station in 1902 after serving ten years with the Utah Agricultural Experiment Station. Linfield was named Director of the Montana Agricultural Experiment Station in 1904 and served in that post until his retirement in 1937, a total of 33 years. Linfield began a dryland farming research program in 1906 after a buggy trip around the state to learn the concerns of Montana’s producers. Linfield was the principal of the School of Agriculture short courses from 1903 to 1907 when the School was reorganized by Linfield and President J. Hamilton to offer a three year course of study with classes held six months of the year. Linfield was appointed as the first Dean of the School of Agriculture in 1913 and remained Dean until his retirement in 1937, a total of 24 years. The School was reorganized again in 1922 to offer unit courses in specific departmental topics. Group courses in diversified farming, livestock production, and tractor grain farming were offered from 1929 to 1933. Professor Linfield managed the early development of policies, procedures and direction for both the Montana Agricultural Experiment Station and the College of Agriculture, laying the foundation for the institutions as they exist today—responsive to the needs of producers and students. His vision and persistence are unmatched. Frederic Bloomfield Linfield died in Billings in 1948 at the age of 82. The building where he spent the vast majority of his career guiding the fledgling agricultural education and research activities for Montana was named in his honor in September 1968.